If you are unfamiliar with BitTorrent please go to this page at Pirate Bay for a simple guide to setting yourself up to download and share material through BitTorrent. Where they say 'download a torrent from the piratebay' - replace with 'download the 'route irish torrent from indymedia.ie'. All the rest is the same. 'Azureus' is very simple and straightforward to use and is available for PC and Mac. For viewing you can use VLC. It is available as a free download for Mac and PC here. Thanks to those who have been assisting with this. The film is free. If you want to support this kind of initiative you could make a donation to Indymedia Ireland or Revolt Video. If you hold a screening please leave details in the comments here. Copies of the film without the voice-over commentary are available to interested parties within the broad activist community which uses and contributes to the development of Revolt Video and Indymedia Ireland. It is hoped that those who disagree with the personal analysis/version of events put forward by 'Route Irish', or find it unsatisfactory, or want to improve it, will take it upon themselves to version this slice of history. You can contact the editor of the film at ecrudden (at) gmail (dot) com. I welcome the video online! However, people should be aware of the PC/Internet security issues surrounding P2P Technologies like this one. Indeed, when I visited The Pirate Bay website I had 3 Spyware intrusions with 2 minutes. Spend a couple of minutes reading this neat (and easy to understand) Trinity College P2P Security overview if your new to this technology. Nasty things these feckin spywares and viruses. "careful now, down with that sort of thing"! Probably better to Google video and YouTube it for the non-techie heads out there. I'm a PC user and I use The Pirate Bay all the time. So does quite alot of the internet. To say that you had a spyware attack from them is quite an accusation. Of corse I can't be sure, but as far as I know, and have no reason to think otherwise, my computer is completely healthy after years of using torrents. This is the full potential of the internet. Stop trying to scare people away from it. Besides, nobody has to go to that website anyway, the link to the torrent is on this page. It's completely safe! Anyone HAving Problems till this is sorted . . .
Mail me at ecrudden At gmail dot com and I will send you the torrent file. I would recommend utorrent which is available at ( http://www.utorrent.com/download.php ). It is opensource( http://www.opensource.org/ ) and small and reliable. On the same topic, another country. Could somebody please put this film up on video google it would make the whole process easier for everybody!!!!!!!!! I must say though that I looked at Google Videos terms and conditions and they are downright scary especially when a lot of the material has been given to me on trust by others. If someone else takes it upon themselves to do it - so be it. The torrent will work well if people take a couple of minutes to set up to get it. No corporations involved and much higher quality file. This is how the kids get their pirated movies etc and it works great. The scaremongering above is just that - scaremongering. Millions do this every day. ""I welcome the video online! However, people should be aware of the PC/Internet security issues surrounding P2P Technologies like this one. Indeed, when I visited The Pirate Bay website I had 3 Spyware intrusions with 2 minutes. Spend a couple of minutes reading this neat (and easy to understand) Trinity College P2P Security overview if your new to this technology. Nasty things these feckin spywares and viruses. "careful now, down with that sort of thing"!"" Its very clear from your post that you have no clue what you are talking about so it either by ignorance or malice that you are spreading FUD. The paper you link to was written in 2002/2003 and does not mention torrents. It deals with KazaA Morpheus and the Gnutella networks specifically the default share folders that people need to set up to use the clients. The crux was that people failed to RTFM and allowed their entire home folders to be shared allowing you to just search across the entire network looking for exel access or word file extensions. And as for TPB hawking spyware ....crawl back under your bridge. @ ec. "This is how the kids get their pirated movies etc "
It has many uses but those with a vested interest would have you believe otherwise. Joost users watch video via p2p, Skype users make calls via p2p. SKY by Broadband installs the Kontiki p2p client and shares out your bandwidth the list goes on and on. I agree that the ToC on Google Video and YouTube are unacceptable. Perhaps you might have a look at uploading to Archives.org or Miro(previously known as Democracy Player) it contains a BT client and VLC. /Thanks to all involved in the making of this film. I am well aware that P2P Bittorrent has many uses outside movie piracy but it is the most widespread use of it, and the use of it that indicates how effective a method it can be for small producers of media to do distribution - I suppose that's the half baked thought that made me post the above. In fact making as much 'legal' use of this kind of technology as possible as far as I understand it is one of the most effective ways of ensuring that it continues to exist. The more legal use is made of it the harder it becomes for legal systems in various juristictions to force isps to strangle it and shut it down. As for putting the file elsewhere - I'm very happy for anyone who downloads the file to use their imaginations in helping to ensure it gets wide distribution. Post it to Archive.org. Write to blogs and ask them to mention it. Post reviews if you have a blog. Recommend it to people. Mail people the torrent etc. Seed the file and upload the torrent to other trackers. Make it available as a direct download if you have a server etc. I'm in dial-up land so can't do much about putting the file elsewhere. Right click the link and 'save target as' to download. Thanks pixie. No terms and conditions. I downloaded the film yesterday, and just watched it now. The film covers most of the tactics I remember used by the movement (from NVDA and Ploughshares actions to talks, media work and vigils), but there's very about strategy in there. As a consequence the viewer is left agreeing with the film's suspicions about politicians and organizers and just about everyone else who participated. The only people who escape judgement are those who didn't join the movement at all -- i.e. 95% of the Irish population. "Appealing to the egotism of a generation" is pretty harsh, and as is all the stuff about "not in my name Vs over my dead body". If we're to be successful in loving our neighbour (never mind our enemy!) as we love ourselves, we need to start by loving ourselves a little. Yes, we've all got ego. So do villagers in Afghanistan, and some of them do rotten things you don't even want to know about. No, we don't need to be a martyr to "be authentic" or "for real" or whatever. 1. A film about the NVDA tactics used at Shannon and elsewhere, including they objectives, resources required to pull them off, results, learnings. 2. A film about the media strategies used by the movement and by our opposition, including online/press/tv/radio, objectives, results, learnings. 3. A film about the political and legal strategies used by the movement and by our opposition, objectives, results, learnings. The film is really good! Well done. It is harsh I suppose. But the campaign as a whole if you take the denial of Shannon as a transit point to the US military as it's objective, or if you take forcing the government to search planes going through as an objective, did fail comprehensively despite there being huge popular support for it at one time. So it was never going to be a happy tale. I find it hard to see any bright side to the whole situation looking back on it. As for tactics and strategy - you're right - the film goes through the tactics used - it is meant as a history and I don't ever remember there being any sense of an overall sense of strategy - the whole thing was very fragmented and the combination of events that succeeded in bringing the situation to a head was as much luck as anything widely agreed by the groups involved. I always thought at the time, and still think, that a way of forcing in a safe way Faslane style mass arrests would have been key to any effective way of upping the ante in the campaign. But even March 1st if you look back was planned without this being an objective / favoured outcome. People were left with no possibility for something between smashing a plane - heading into shannon in the night - or marching. The state here does not want to do this ever really during any campaign. The way the rossport 5 became popular heroes helps to show why. There was great solidarity around those arrested at shannon. If many ppl had been facing court for lesser charges it would really have been something. People seem to be attempting this outcome in Rossport at some of the actions there lately and maybe they will succeed at some point. If I was them or involved (which I'm not) I'd be trying to find a way to make the point strongly to the public at large that the Gardai SHOULD be arresting people who break the law. The 'egotism' thing is the only way I could find of trying to explain why the whole Feb 15th phenomenon happened the way it did - huge but insubstantial in terms of staying power or follow up. It made ppl feel good about themselves. Like the centre of the world. Quite like Live Aid in a way. Or Live Earth. One of those consumed experiences of global togetherness. A cheap high - a kind of coke buzz. As for your proposed subject matter for a film - yes these things are important - but I was trying to capture what happened - not what I would like to have happened - or 'what should have been done' according to me. As for the Martyr thing - I was comparing i think people at war / people trying to get in the way of war - with people saying of a war - 'not in my name'. Anyway my big get out of jail free card for this one is that I'll give the raw materials of the film to anyone who wants badly enough to tell the story in a different way. Thanks for feedback and seeding Eoin. Both are very much appreciated. Does minister Gormley still support removing US military presence from Ireland? then the audience expands even more. Miro (used to be called DemocracyPlayer) is a nice little player (not quite as good as VLC ) but the important thing is that the creators are trying to make it simple and easy for everyone to watch "internet TV". Response to Eoin D - on the film, the war, the movement and misuse of the term "martyr"
Angry words maybe, but anger is part of the prophetic emotion. I think the filmmaker makes a point here that "not in my name" is not enough. Given the nature of modern warfare, the state does not need popular support (like the jingoinsm of WW1) to wage war. All they require form us in the First World is our silence, sedation and cynicism. As I wrote from Limerick prison at the time there is a consensus between the warmaking state and the protest opposition "You can have your protest, as long as we can have our war!" The dynamic absent was the lack of a relationship between the protest movement in Ireland and the nonviolent resistance that occured at Shannon. Was that just unfortunate bad luck or did those calling the shots in the protest movement in Ireland seek to marginalise NVDA? Also from a prison letter at the time I reflected on political groups playing the old games of stack and counterstack seeing the war as primarily a marketting opportunity for their brand, newspaper sales, possible recruitment potential to their own organisations and in the Greens case in retrospect a springboard to join the warmaking state. As the filmmaker suggests the protest movement leadership was not serious about having their lives disrupted to intervene in the war. I must object to your popular desirory misuse the term "martyr". A martyr in the Christian tradition is a witness to the fullness of life, not someone obssessed with death and suffering for its own sake. Someone who wants to live life to the full and pays for not compromising. The 6 Jesuits and tens of thousands of Latin Americans who died in the U.S. wars on Central America www.soaw.org desired life and justice for all and paid with their lives, torture, imprisonment, scandal, blacklisted. Daniel Berrigan reflects well on this following Catonsville 9 draft board raid. The consequences of the ploughshares action at Shannon were perceived through privileged First World eyes as great, in the Third World they would be minimal. Yet the moderate and authoritarian left kept branding, attacking and marginalising us with this term.....martyr! One way to define something out of existence in this context, I guess. Like all texts, "Route Irish" is a limited text. It is a subjective view of what occured at Shannon and the rise and fall of the anti-war movement in Ireland in a specific limited period. Others wished for a more objective film to be made. You desire films on techniques. Those films are not this one, but they wait to be made. The nonviolent resistance strategies were in someways short term, immediate and urgent. (Well they weren't too short time for the Pitstops www.peaceontrial.com who remained engaged with the war and resistance through three trials for 3 1/2 years!) The movement collapsed before longer term strategies could be explored. As was being advocated by a few folks at the time the Trident Ploughshares campaign http://www.tridentploughshares.org/index.php3 in Scotland is a workable, relatively local model that could be amended and adopted in Ireland. A model that is based on nonviolence, direct democracy and high risk/low risk direct action. A model that ressurected the nuclear weapons issue in a post-cold war period where the cultural & political elites defined it as dead. A model that may in the near future be politically successful in removing nuclear weapons from Scotland. (as they were removed with similar strategies form Aotearoa/New Zealand and as U.S. troops could be removed fromIreland). The film has a theme of disappointment. And that is a relevant theme as the war escalate and expands and the anti-war movement dissipates. Some feedback on 'Route Irish'. A few thoughts in 'review'. Italics = quotes from the film commentary. Congratulations to Eamonn on a great piece of work and a really serious full length documentary with a powerful commentary. I'm supposing it can't have been easy for him to run with what is, in my opinion, an accurately harsh and honest analysis of a comprehensive failure as he puts it. And Eamonn says that he finds it hard to see a bright side. But I see a bright side to this very sad but very uplifting and surprisingly edifying documentary. And there's the power of it. And if we learn from it, and it's a very good lesson, then the brave move of the film-maker will have paid off. A movement of huge popular support, the sense that anything could happen, in the hope of an event to emerge to set the clock to zero and free us from a nation led by a suffocated generation (eh ... that'd be the State) of crooks and jugglers. CIA agents at Shannon given positions of authority. Ignorant cops and cabinet ministers refusing to give account for themselves. New opaque norms, as much a part of the unrestrained imperial aggression as any secret prison. Green politicians, SWP'ers and other 'not in my name' opportunees playing a game with no stakes and no intention for serious dissent. And no appetite for a real conflict with the state. Foiled by the strongest weapon of the state ... again. The cops. An Garda Síochána. The state protectors and the people haters. And The state knows that those who want, who bombard with demands without a willingness to sacrifice anything meaningful can always be outweighted. Not that the movement is without those who are willing to sacrifice meaningfully, it's just that it was compromised by those who aren't. Inexperience and ignorance of the law didn't help either. In my opinion, in order to make progress in any conflict between the people and the state, it is essential to disarm the state of it's most important weapon - the pigs they call the guardians of the peace whose only power to protect a criminal state comes from their unlawful abuse of the law. The lesson to be learned has got to be that we must learn, know and use the law to assist us in removing unlawful barriers to protest and/or legitimate civil disobedience to the greater state crimes of social injustice, environmental destruction and in the case of Shannon, murder and torture committed in complicity by the state. Then you've a chance to set the clock to zero and ... anything can happen. So 'Route Irish' is a real opportunity to reflect and learn - not in a vacuum - but from hard work already done and experience gained. And to think on the good things and repeat them alongside a fresh strategy and effective tactics. Cos there's always gonna be a next time. Thumbs up on the dvd but the critical mind must be unpacked once it has had its say so that we can reinvest in relationships right across the radical perspective.. Much of what's being said is best left to internal review and re-assessment amongst the activist community; there's a real danger that you just expose the cracks to the system, which of course will apply the levers and wedges free of charge. There is no going on without friends and allies; so use critical capacities to reconstruct not deconstruct.. Revelation is a home truth, so keep it there. A failure for the 'activists' or failure for Ireland? The latter I think. Here in Budapest Hungary I think we have three seeders now and the Közért Collective (a space similar to seomra spraoi) has bought a new video projector for a regular friday night activist video show. If the technology goddess blesses us this friday we plan on having a group Skype Q&A immediately after with eamonn about his film. We have high hopes this will be a model for future public events. thanks for the suggestion rahood. I'll make an mp3 and put it somewhere. Can't seem to get it onto onebigtorrent.org - formerly chomskytorrents - can anyone do it 4 me? Other suggestions of places where I should upload torrent welcome. Wow those feckin sites are SOOO busy and populated. In one an admin added links to revolt and here to the post in 30 seconds flat. You're far better at 'selling' it than I am. Much appreciated. Just saw this at OBT. There's much good content there so check out the rest. Help Martin maintain OBT with any contributions you can. I'll be showing this to the peace group here in US. There's a world of important content on torrents. Its posted on http://visionontv.net as well as a torrent. Coming soon. The current revolution in internet TV represents a historic opportunity for radical video to realize its potential as an agent for social change. To this end, Undercurrents has begun a project called VISIONonTV. This project is not mere video on the web, but IPTV, a television station which updates the twentieth century medium of television for the broadband era. It will be as to easy to use as the old box in your living room. I have a very hi quality as per vision on guidelines version on the way - it's taking me auld mac a long long time to output it. I suppose it's part of trying to do this kind of thing. Registered at both. Posts get bumped off. This is the core of it - the thing which so many have taken too long to recognise and to commit to - personally guilty of that and ashamed to think of all that it took to cop on. Indymedia has been an education in that respect - a door onto a world which this very flawed and blinkered person would probably never have come by otherwise. ...bringing the situation to a head was as much luck as anything widely agreed by the groups involved." - "The Peace Camp [was] initiated by some veterans of Greenham Common..."
Can anyone verify that the Peace Camp was initiated by Greenham Common veterans? From my search of the indymedia archives the first mention of the Peace Camp is found at the Second Grassroots Gathering, which took place in Cork in the spring of 2002. "Suggestions included: Peace camp w/e at Shannon targeting issue of Irish neutrality"
to suggest that our energies in bringing situations to a head "was as much luck as anything"
"I always thought at the time, and still think, that a way of forcing in a safe way Faslane style mass arrests would have been key to any effective way of upping the ante in the campaign." Did you use your energies to push the idea through at the time? and wait for 'some veterans of Faslane' to do it for you? An English guy Adam (?) and maybe Dubsky were pushing the Faslane strategy but not very successfully....never got traction. Although a crew from Limerick Uni and others had been busted at Faslane previously. 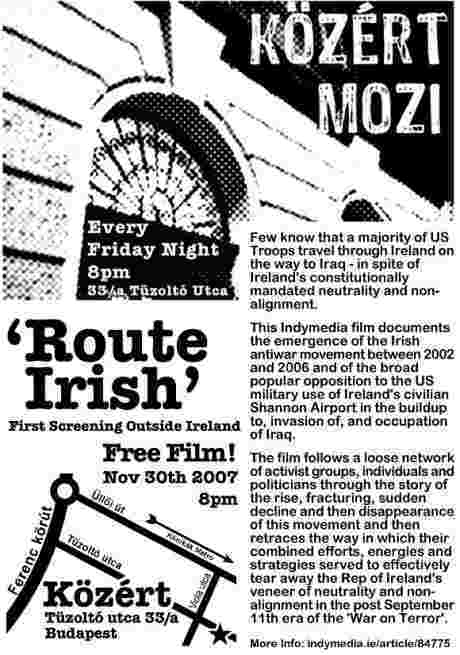 "From my search of the indymedia archives the first mention of the Peace Camp is found at the Second Grassroots Gathering, which took place in Cork in the spring of 2002. The film very much acknowledges that the camp and the people around it, the grassroots groups who pulled down the fence, succeeded very well in bringing the whole issue to national attention. When I'm speaking about an overall sense of strategy - I mean a strategy shared by the various factions of the movement against the use of shannon when it as a whole had big popular support - Yes various groups involved had their own strategies but they were far far far from co-ordinated as a whole. When they woked effectively together it WAS luck as much as anything else i believe. As to why I didn't involve myself in such arguments at the time - well I did to some extent and could probably dig up some evidence in the archives here but have little desire to start justifying my actions at this stage. "The peace camp [was] initiated by some veterans of Greenham Common..."
I'm critical of those words that ec use's in the film. 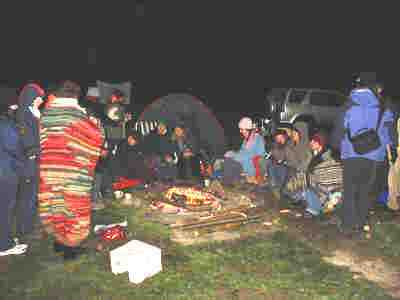 I've provided historical evidence (see link above) to show that the peace camp was "initiated" in public in March of 2002. It was not a product of "luck". committed themselves to a Peace Camp at Shannon. At a later stage ("around Christmas 02" according to 'From memory' above) the initiative was joined by a (some) veteran(s) of Greenham Common. such as the one to be held in Cork? As one of the many founding members of the Shannon Peace Camp I think I am in good position to give the definitive history on the debate of the “who and how” the peace camp started. Of course this is really only my point of view. Please feel free to challenge me. Apologies if I don't mention you but there were hundreds of people who came and went during this period. I had been monitoring the planes alone at the terminal building for sometime before I found out that Tim and Ed had been doing so, on the now closed off viewing area at the other side of the airfield. Dubsky told me that I would meet Tim at the "Reclaim the Streets" party in Dublin held on the 22nd of September that year. So I travelled by bus the one hundred and fifty miles up to Dublin to meet some who lived less than fifteen miles away from. I am glad I did as I had not been to a "reclaim the streets" gig for a very long time. When I got up to Dublin I met some familiar faces from Ecotopia. Cllr David Healy of the Green Party who had been one of the people in my affinity group at the protest at Shannon in August pointed Tim out to me. Tim who is over six feet in height with a neat haircut was a standing by a lamp post while Ciaran Cuff was playing with some children in a sand pit in the middle of road outside the Stephens Green shopping centre. When I introduced myself to Tim it became clear he that was as suspicious as I was. The next night we found ourselves sitting under a plastic tarp in the misty rain fifty metres from the runway at Shannon waiting for that nights issue of US troops to arrive at Shannon Airport. This would be our nightly pursuit for the next two or three months. During a short break to Amsterdam to visit a school friend I learnt through indymedia that Eoin Dubsky and a unnamed friend had entered the airfield at Shannon and defaced one of Uncle Sam's Warplanes. Things were beginning to heat up at Shannon Airport. After a few weeks things settled down again and Tim took a trip to Scotland. I got a phone call from Ed inviting me to meeting with some peace activists from Cork. The venue was the sitting room of Kay White who had been part of the organising team of Ecotopia a few months previous. When I arrived Ed introduced me to Kay Mary Kelly and Becky Garcia. Mary and Becky had a car full of camping equipment and were ready for action; Ed who was more reserved wasn't so keen to set up a camp that night but proposed that we do a recce as a first step. This perceived lack of interest seemed to be frustrating for Mary and the meeting was starting break down as these two strong personalities measured each other. As the tension grew I announced that I had secured a house in Shannon as base for the peace camp. This idea was dismissed as Mary wanted to go straight to the Airport with her tent on that wet Novembers night. Eventually to break the deadlock we drove to the airport to pick a site. The Peace Camp would be on a waste ground near the shore of the Shannon River facing the Aer lingus cargo loading building. There was a good feeling standing on that waste ground as a pair of white swans flew over our heads and down the Shannon Estuary. This feeling was short lived for Mary and Becky has packed the tent sand groundsheets back into their little gray van and set out to return for Baltimore. Later that day Mary had told me she wasn't going to return. That morning I was meeting up with a Canadian student who wanted to interview an Irish peace activist for his thesis. To show him exactly the work I was doing I invited him to meet me at the airport. We went up to the viewing gallery on the third floor of the airport's terminal building. This area offers a good view of the departures lounge and the airfield. As a World Airways jet was leaving the gate another US troop jet was releasing more soldiers to the duty free lounge. As I was putting a lens on my camera the Chief Officer of the Airport Police and Fire service, Tom Hanley, and two other members of the Airport Police barge in the viewing Gallery. Hanley made a beeline for me; then grabbed all my camera equipment without saying a word he ran out the door. Of course there was a few choice words exchanged outside the terminal building. As I was hoping to get a photograph of the troop plane I sprinted the 400 meters to the cargo gate with my bewildered companion following behind me. Fortunately the plane was taxiing past the gates when I got there. I pulled out my camera and started to snap the plane. To the left of the viewfinder I could Chief Hanley and another middle-aged Airport Policeman sprinting towards me. I continued to snap thinking these will be great sporting images but I never got to see these prints. The two men grabbed me and trussed me up until an Airport Police patrol car arrived on the scene and the middle-aged crime stoppers conveyed me to the Shannon Gardai Station. Arriving at the stations public office, Dennis Swift, one of the local Gardai opened the door to let the two members of the Airport Police through leaving me alone. I turned to walk out the front door as Garda Swift said goodbye. Think this was all a bit strange I ran Ed Horgan who has dropped everything and was on his way to Shannon. Ed accompanied me to the station where I made a statement of complaint for these assault and Kidnapping. Of course this never materialised in to a court case. The Gardai protected the Airport Police against the naive peace activist. I would not see camera equipment for another few weeks and funny enough the film confiscated in the interest of national security. Ed told me he had rang Mary and Becky who had turned their little grey van around and when relatively speeding back in the Shannon direction. After awhile we all were drinking tea in a little cafe in the Shannon Town Centre. There was a lot of focus on my bogus arrest and I was feeling uncomfortable. I was relieved when Mary changed the theme of conversation by asking me about the house I was talking about the night before. Seizing the day I took the tea party down through the estates of Shannon to show them what became known the Peace House. We negotiated a sweetheart deal with the owner of the house and moved in the next day. The house had not been lived in for some time and the landlady was using it to store he families past live. After several days of shifting old clothes, toy s and furniture we applied a lick of paint to walls and made it inhabitable again. Tim arrived home from Glasgow startled by the changes to the campaign. The house was a great resource and a core group of people started to gel together. Word had gotten out and people started to visit this open house regularly. Tim and I would spend the night monitoring warplanes will Mary and Becky created a campaign headquarters. After the phone was installed Barry arrived with a computer and while others brought office equipment, mattresses, food etc. Other people moved in the house to volunteer. Some would stay for a day or two others for weeks on end. We fought that everyone brought happiness to the house, some by coming and others by leaving. Early in December the “Grass Roots Gathering” demonstration set off from Tullyvarragh Hall to the Airport. Mary invited everyone back for tea and bowl of soup. Heavens knows what the neighbours thought as three bus loads of protesters trooped in to the house. The “Peace House” had arrived in to activist society. Mary spent her days on the phone urging people to get involved. The support came in thick and fast as the campaign gathered momentum. Tents, tepees and tarpaulins were stacked up in the spare room while other camping equipment was stacked outside in the backyard. The Peace Camp was nearly ready to be rolled out but there were issues. Ed had put out a call out for the peace camp on indymedia. Along with a wish list Ed gave a general invite to people to get involved in setting up the Peace Camp run on the lines of the successful Greenham Common Peace Camp in the UK. This did not go down well with everyone. Margareta D’Arcy, a veteran of the Peace Camp at RAF Greenham made it known that it was a women’s protest and therefore the Shannon Peace Camp should be a women’s camp also. Fearing a split before the camp had even started Mary was sent as our envoy to talk to Margaret. Mary spent the day with Margareta at her house in Galway were they brokered a deal. When Mary came back to Shannon later that evening we all feared that Mary and Margareta would clash. Our fears were unfounded and when we heard of the proposal we were all delighted. Margareta and Mary devised a plan that eventually later was seen as a media and tactical coupe. We invited the Women of Ireland to camp on the doorstep of Shannon Airport for a twenty four hour vigil on the eve of what is know in Ireland as Nollaig na mBan or Women’s Little Christmas. At this stage another strong personality arrived to the house. Tracey Ryan arrived back Palestine where she had been volunteering with the International Solidarity Movement. Tracey with her charismatic personality later took on the tasked of being Shannon Peace Camp’s public face. As the sixth of January arrived the house teemed with energy. As vans and cars were loaded we all began to mentally prepare but no one knew what to expect. We had been planning this day for months but could not assume that the airport officials would tolerate us setting up camp on their land. In the Afternoon the women left for the Airport and parked up by the site we had chosen on that November night. They were met by a group of Airport Police who told them they could not set up camp there but steered them to a flat bit of ground near the entrance to the airport grounds. This site was far superior as it was easier to see by people travelling to the airport and the industrial estate. This effectively gave our protest a larger audience. As the women pitched their tents the men took over the support role. The night of January 6th 2003 was the coldest night in decades. As the ground began to freeze a big hearty pot of “Potage Bon Femme” or Leek and Potato soup arrived and a bottle of whiskey was produced from under a duffle coat. The support from the public was overwhelming as people arrived with cakes, sandwiches, and much more. Brother Anthony from Glenstal Abbey in Murroe, Limerick arrived with a pick up truck with firewood from the monasteries’ forest to add to the car loads of turf, briquettes, and kindling supplied by the many well-wishers. The success of the Peace Camp’s 24 hour vigil was beginning to be realised as the press arrived to tell the world that the women of Ireland were making a stand against war. For the next four weeks hardly a day would go by without a mention in the papers. The next day the authorities waited in the wing for the camp to fold up. The women made their point and everyone knew they were only doing their job. Sure wouldn’t they be pleased if the government stopped US Military using their airport as pit-stop. I don’t know when it dawned on them that we were no leaving but I can only presume it might have been when we rolled the caravan on to camp site. We had claimed our turf and from that moment Shannon Peace Camp would be an open house to all who opposed the use of Shannon Airport by the use military on route to war. We hope to show it in is Shannon and Limerick during December as a run up to the peace camp vigil. I think what conor says chimes with her having 'initiated' the camp. She is a greenham common veteran. I thought there were other veterans of it involved at the time. Perhaps I'm wrong. But not too wrong. I thought the historic link would be interesting for an audience in Uk or elsewhere abroad. I will mention that this is disputed in cork - or someone will for me if I'm not there. Thanks Conor for the very vivid above account. I only got there after the caravan. You have a memory like an elephant. As it says in end credits of film here (indymedia.ie) is where you can find the whole story 'from the horses mouth'. Thanx Conor for that history. I suspect the "Canadian student" was actually a U.S. student Mike. The first recruit to the Dublin Catholic Worker. Following Ecotopia, he called to vlolunteer at the nonexistent Catholic Worker soup kitchen. I said "Sure!". From mid-2002, we ended up doing a weekly anti-war vigil at the GPO on Mondays and taking the bus to my housesitting gig in Ballyfermot where we would have soup and a CW liturgy with a Buddhist, an agnostic and a situationist. Following his formative activist experience in Ireland, Mike returned to the U.S. to become a fulltime Catholic Worker getting busted a number of times doing NVDA against the war. For the last 3 years he has worked fulltime for "GI Hotline" where he advises members of the U.S. military who call form around the U.S. and from around the world on their oprions to get out of the military. So you never know the consequences and influences your actions have! I know Mike's experiences with you at Shannon had a significant influence on his life's trajectory. Mike had been a high school student of Kathy Kelly's in Chicago. Mike is quite intellectually gifted, handsome and a good singer. As the Buddhist remarked in 2002, "This guy is going to end up being a Professor or in jail for a very long time!" Gald to hear of this new initiative at Shannon and always impressed by the steadfastness of you, Tim, Ed and others. Well the number of views/downloads of the film that I can count through torrents / vuze (Thanks to whoever put it there yesterday) / Stage 6 went well past the 500 mark last night. 60 people are now seeding so it's fast to get at present. About 15 people are downloading it at any given time. Big thanks to seeders and others who have been helping spread the word. Just to put this in perspective. The previous feature length documentary I edited and distributed through 'activist' channels was distributed on VHS tapes (Remember those anyone!) and in total less than 200 were ever sent out into the world. Maybe I should see about redistributing it like this! I'm running out of steam mailing people and posting to bring this one to peoples attention so hopefully those who thought it worthwhile will chip in and use their imaginations in spreading the word about it. The one thing that hasn't been done is get it on piratebay - so if anyone reading knows how to remake the torrent for them please do it. Want to say thanks here to the gang in Budapest who arranged a screening on friday evening. I had the disconcerting but good experience of doing a sustained queston and answer session afterwards on skype with the very international audience. It was disconcerting mostly because I was in a net cafe and I was the only one there talking. Oh and remember it fits on a cdr for ppl you know are interested but like me living in dialupland. An influential bunch of liberals - they helped get shell story into the Norwegian newspapers a long time ago during the time when the rossport 5 were in jail. Congrats Eamonn on the success so far, tis shifting like hotcakes. I'd advise putting Mousetrap on torrent too. Maybe the first two trackers should be the two above? I've messed around with my torrent software and have found that the only tracker in the torrent currently is the Indy tracker. I'm a newby with torrents and don't have a clue how to do this. Any help or tips would be appreciated. It'd be a pity to miss piratebay as it's an incredible source. I've become a fan of torrents since this article prompted me to check em out. I've just 'scraped' the torrent (I'm learning da lingo) and according to the update there have been 440 completed downloads and there are currently 55 seeds and 26 leechers. Eamon, to watching your documentary over xmas. Great achievement on getting it finished ! and out there far and wide. Re comment from S. aerobics- "I've provided historical evidence (see link above) to show that the peace camp was "initiated" in public in March of 2002." I attended many meetings in the old CAZ venue in Cork around then and yes, I remember the idea of a peace camp at Shannon being discussed. I imagine it may also have been suggested at other groups around the country at that time of intense build up to re invasion of Iraq. However it was Margaretta D'Arcy with a couple of women who had also been at Greenham took the initial practical step of saying they would come and then did- arriving for Nollaig na Mban and setting up the first tent that burst into the peace camp. Thats my recall of it. I'd like to pay a brief tribute to Robin Hennessy who died very suddenly last week. There was a humanistic service for him yesterday in Dublin, and tomorrow he will be buried in Kanturk following 2pm mass, beside Liz Tully his beloved partner who died only seven months ago. Robin was a very special loving person. He and Liz spent much of their lives fighting injustice worldwide, and more recently dedicated their time to exposing the complicity of the Irish government in illegal wars. Combined, they had an amazing fount of knowledge and wisdom, and were an inspirational example of passionate engagement with their beliefs. They recognised the importance of supporting those of us on trial for many and varied actions at Shannon. That support was practical and visionary ; they have left to us a wealth of practical knowledge and connections to other deeply caring citizens at home and far afield. Initially we met through the peace camp. I am deeply grateful to have know these two exceptionally good and decent people. for backing me up on that one! Discussing things and actually doing them are two different things as you I imagine well know. Sorry u haven't got a copy yet. Burning DVDs keeps getting put off till later as i've been prowling the internet too much for my own good getting it out there. It'll get to you. Thanks to the efforts of a very hard working Indymedia volunteer the film is now available at Piratebay. If you haven't downloaded yet and are intending on doing so go there to get it so there are seeds for it as it is a different torrent to the original. The torrent file as originally published on this page is the best one to use. The only difference between the Pirate Bay torrent and the original indymedia.ie torrent is that it uses a different tracker which doesn't really matter to regular users. The important difference for downloaders is that there are far more people sharing the film using the original torrent - currently 51 seeders compared to 29 leechers (downloaders) - while the Pirate Bay torrent only has 3 people sharing the file. That means people using the indymedia.ie torrent will download the film much faster since there are so many more people sharing it. One of the problems with popular public BitTorrent trackers such as The Pirate Bay is that there's a large proportion of hit-and-runners (people who download the full file but stop sharing it as soon as their download is complete). There seems to be a better sense of community among the people using the indymedia.ie torrent. Over the past 10 days or so, there has been a consistently high proportion of downloaders continuing to share the file to others. Anyone want to upload this on rapidshare? Torrents are messy and unpredictable. Couldn't indymedia host it? I think that a direct download would be grabbed by much more people than a torrent. They can host lots of space (no ads). Good spot for films, doc's, etc. A lot of public domain and creative commons material. Rapidshare says "Upload-Limit: Unlimited! (Max. 100 MB per file! Split-Archives allowed!)." The torrent is already being seeded from Indymedia and quite a number of people that use the site are doing the same..
Could you imagine what say 500 downloads of an 700mb file would do to the sites bandwidth? Torrents are a perfectly fine solution to file distribution, just try them out and a world of free culture awaits you - especially if you can get an invite to one of the private tracker forums. More bleedn' tarrants. Whatever happened de good aoul trip to xtravision for a betamax and some of manhattans finest popcorn? I'm not up to all dis technology anymore. Young lads from Canada shoutin about net neutrality and all de rest. Uncle Bill just wants a straight up download, no strings attached as he'd say to de russian businessmen on a bad day, or his secretary on a good one. Sure, I'd even be up for unrar'n it mesel. Is there anyway this feature can be moved to the opening indymedia page. I know of people who would still need this link to get get hold of Route Irish but might not be familiar with the website enough to go through the feature pages to find it. downloads from various places with counters now add up to 1000 or more. They've dropped absolutely like a stone since it got bumped off front page so I second k comment above - even the thumbnail somewhere would be nice. Thanks loads to E. and others who sorted out a screening and a trip by luxurious train to CAZ Cork last night, and thanks to those who turned out on a rotten windy wet night. Please Keep Seeding!! Specially Piratebay one. Just looked at torrent statistics. Lots of downloads still going on. If you have downloaded via piratebay please seed as much as you downloaded at least. Lots of people (55) leeching from 3 seeds there at present. The indymedia torrent is much more healthy with 56 leeching from 35. I would love to know where those 120 people have come from. "PeerGuardian and PeerGuardian 2 are free and open source programs developed by Phoenix Labs. They are capable of blocking incoming and outgoing connections based on IP blocklists. The system is also capable of blocking advertising, spyware, government and educational ranges, depending upon user preferences." Various media corporations, governments, the RIAA and front groups have peers and IPs set up, and even clients such as ziptorrent* which are designed to slow down the swarm. Using a simple application to block them, such as PeerGuardian, prevents this activity and will speed up your P2P downloads. PeerGuardian also protects your pc and your ip address from malicious software and organisations. http://portforward.com/ shows you how for every make of router. "BitTorrent users are facing a new enemy. A BitTorrent client named ZipTorrent, allegedly created by our friends from the anti-piracy organization Media Defender, leeches bandwith and spreads useless data chunks...."
The above comment is good advice if you're downloading torrents that contain executable files (they may contain viruses or other malware) or if you're downloading files of copyrighted material that the MPAA or RIAA are interested in. Most good BitTorrent clients will ignore peers that send them data that fails the bad data checks too many times. Of course nothing can be done about dodgy clients that just download from peers that are simply seeding and don't have a way of knowing that the dodgy clients are sending bad data to other peers in the swarm. In this case, the anti-piracy bad guys will succeed in wasting the bandwidth of the good seeds but they will only bother to do this for torrents containing material they consider to be their "intellectual property". To summarise, people who are just interested in downloading Route Irish can safely ignore the above advice as the Route Irish torrent contains no malware and is of no interest to the "anti-piracy" corporations. Will be using the above to get RI on mininova front page shortly. 27 million X 2 eyeballs per month are not to be sniffed at. congratulations on it, good to see a critical view of the movement. On the positive side I think if nothing else the movement exposed the Irish state's complicity very clearly. And whatwere genuinely very small numbers did cause cause some trouble for the state. Its not easy to stop a war, I don't think that we should beat ourselves up for trying. Much of what Eamom mentioned, mass civil disobiedence and arrests did happen in other countries, but that ddn't stop the war either. Whole military bases were surronded in Italy. i don't think we can stop wars by direct action or protest marches, it takes something bigger and invariable political. Direct actions and marches (large and small) are part of this sort of struggle but I suppose we need a mass of people involved in prolonged action, which again isn't easy. It is hard not to be pessemestic when the movement lost such an obvious battle, but on the other hand the people in Ireland who organised and stuck with it (of which i don't include myself) were tiny in number and I think you should all take pride in what you attempted to do. If thats egotistical so be it. Downloads from various trackable places well above 2000 now. The above article added about 100 downloads last night. Thanks to those 10 or so seeders who have been sticking with it. The Pirate Bay has millions of users. If the site contained any spyware or viruses then it would be well publicised. However, usual common sense should be applied as with any download off the internet. As for Google video ... check its terms and conditions. Once you upload a video to Google you are signing up to all sorts of small print. Generally this is in Google's interests rather than the author's. They are offering a free service which is great but people need to consider the terms before uploading their work. Bittorrent is a pain for anyone who has not used it before but a 700Mb DivX or XVID will blow Google/Youtube out the water for video and sound quality. Thank you very much for this movie, I enjoyed it a lot and found it very interesting. That American asking for ID was for me the most striking part of it - it seemed like a minor part, but I think it had a lot of significance. An American in Ireland ordering people around? Scary thought. When the footage of the American quizzing an indy vid head while behind Garda lines at Shannon first surfaced, he was identified as Lt. Col. John O'Sullivan who was based in the US embassy. Shortly after this footage was taken he appeared on the Irish national broadcaster as a spokesperson from the US embassy on a different matter. LNK-"No One Wants to Know"
"No One Wants to Know" about movies on the Iraq war bombing at the box office may reflect on the general disengagement with the war. Not sure if it is the same story with documentaries? Is there a DVD cover art image for this somewhere? 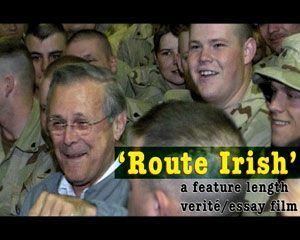 I just watched route irish last week - it's a great movie, that a lot more people should see if they can. The US guy who featured at Shannon asking protestors for ID is the Military Attache at the US Embassy, Dublin - I don't what jurisdiction he has on irish soil to be asking people for ID ? I found his details on this link [http://www.raco.ie/signalpdfs/4_1_electedreps.pdf] - the irish association of serving army officers, though quite see how this guy fits into that category for the irish army but the lines do seem to be getting blurrier and blurrier between ireland and the USA. More people need to see this movie - how can we make it happen ? There isn't any cover art for Route Irish. Tell me the dimentions that you need and I will upload something here for you to use. made to order! Along with my big-up of PeerGuardian above, I can't recommend the light, open-source and accessible utorrent enough. It uses minimal resources and is easily set-up. Some tips on setting it up. When you set up utorrent on the quick setup page, make sure you input your upload speed not your download speed. If you don't know it then this speed can be accessed via speedtest.net ( http://www.speedtest.net/ ). Also, choose encrypt your data during set-up.